In a time when tablets and smartphones are making the headlines, and the pursuit of thin and light has never been more avid, the high-performance laptop is a curious beast. It can’t hope to match the performance of a high-end desktop machine, nor can it compete with the ultra portables on weight and battery life. For some people, though, this machine in the middle is exactly what the doctor ordered. Extreme living space constraints might preclude the use of a normal desktop, or an extremely active travel schedule might leave such a machine collecting dust at home. It might even be as simple as not wanting to maintain two different machines for home and travel use. Whatever the reason, the gaming laptop still has its place, and for such a machine, performance is critical. 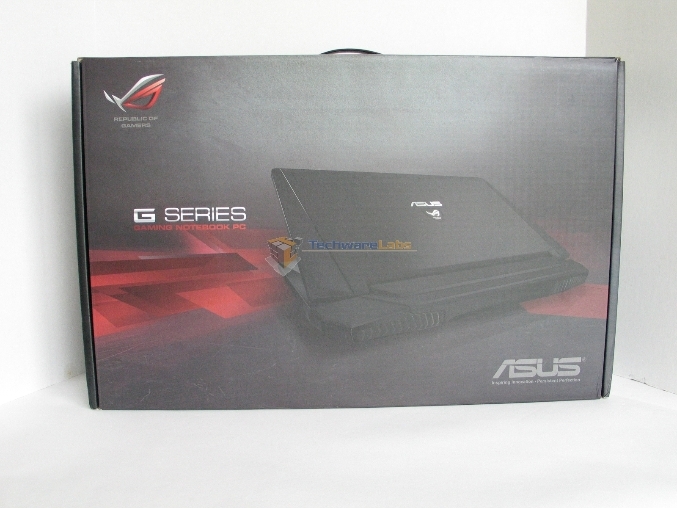 Today, we’re going to be taking a look at the ROG G750JW laptop from Asus. 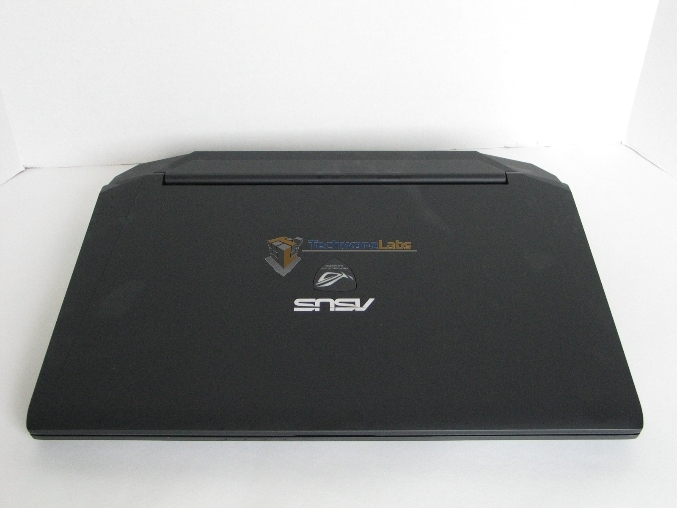 As the latest entry in their gaming laptop series, this machine seems poised to fill that need for high speed in a small form factor. Let’s see what $1400 will get you in terms of portable gaming performance. 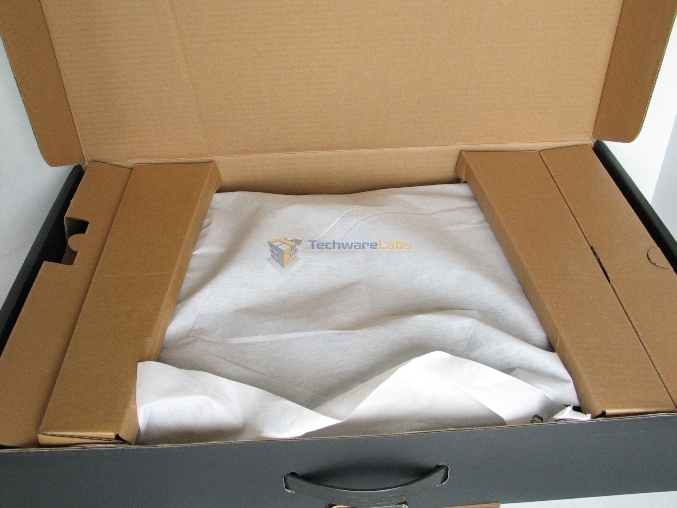 From the moment you see the packaging, one thing is clear: this laptop is unapologetically full-sized. 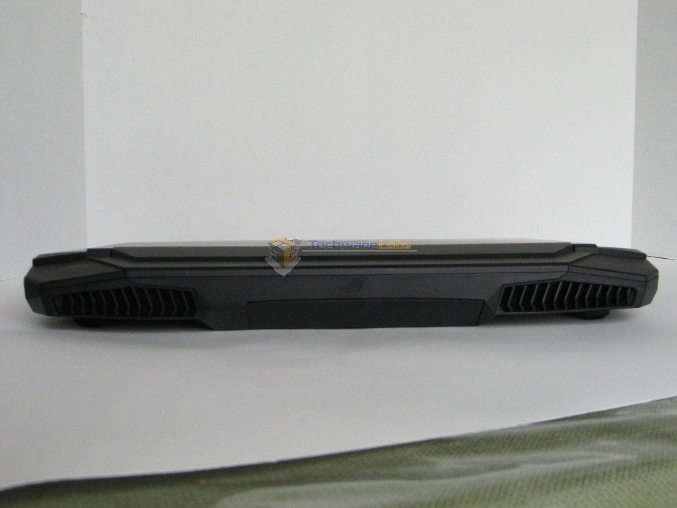 The product shots on the box emphasize this fact, showing off the large, vented rear cooler. None of the box’s size is wasted space, as opening it up makes clear. 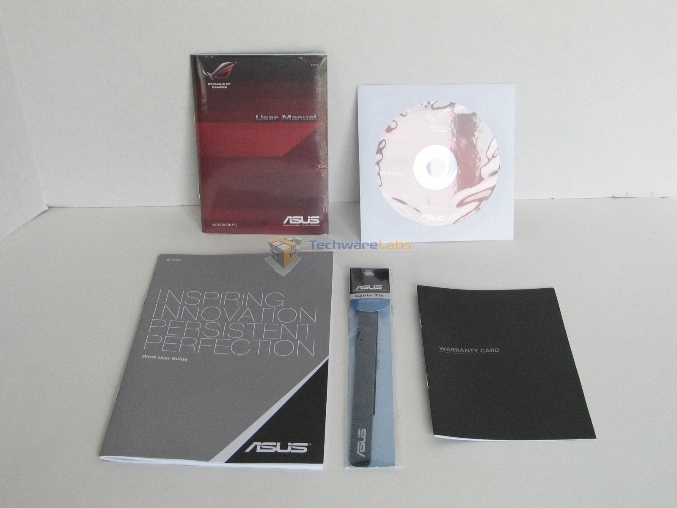 Inside the accessory box, Asus has provided the usual complement: shrink-wrapped manual with microfiber cloth, driver disk, warranty card, Velcro cable tie, and Windows 8 user’s guide. 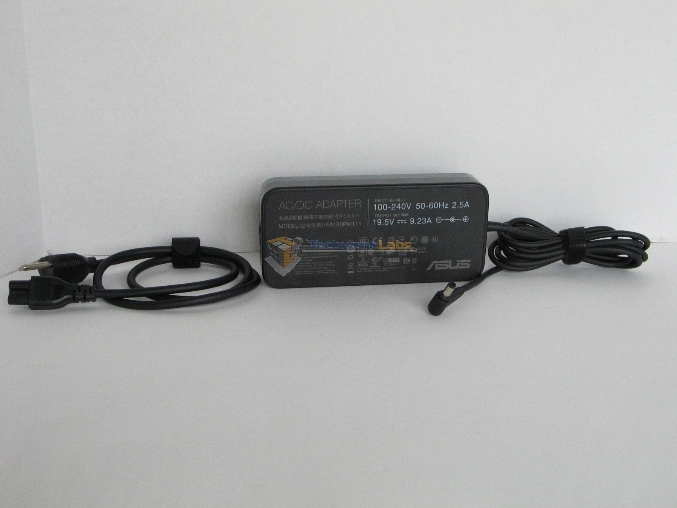 The power adapter, while hardly small, manages to be fairly svelte for something that delivers nearly 180 W of power. 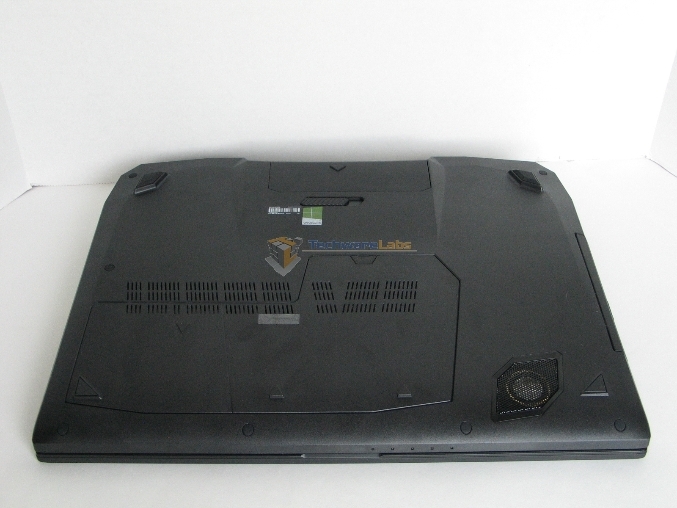 Viewed from above, the lines on this laptop are fairly clean, though the tendency of the rubberized finish to collect and show fingerprints spoils this somewhat. 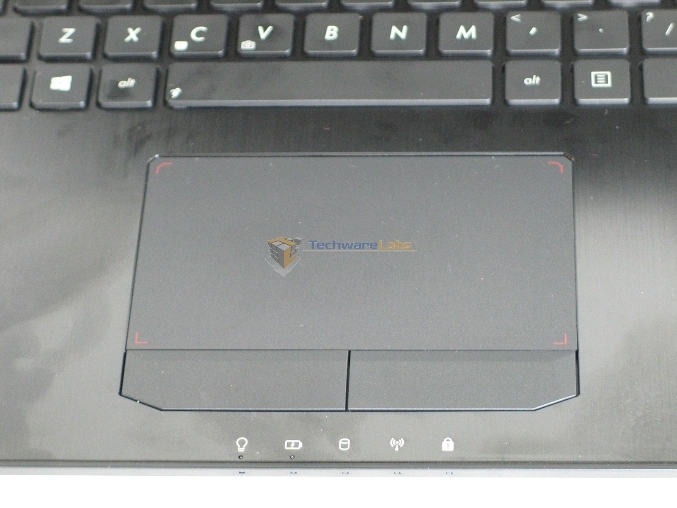 On the underside, the single, large access hatch conceals both 2.5″ hard drive bays and half of the RAM slots. Unfortunately, the double-sided design of the motherboard makes it impossible to upgrade all the RAM without disassembling the machine, which somewhat defeats the purpose of giving us an access hatch in the first place. Pulling the battery latch pops it loose, otherwise it stays firmly in place with no clattering or rattling. 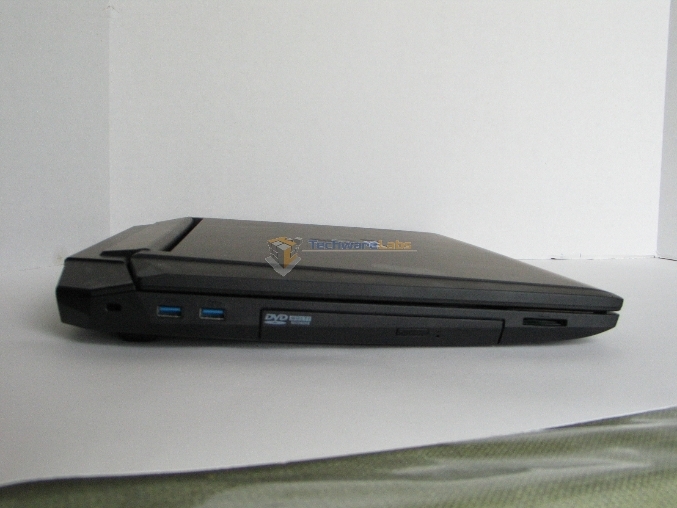 Owing to its size, the G750 can offer a healthy selection of ports without awkward compromises. 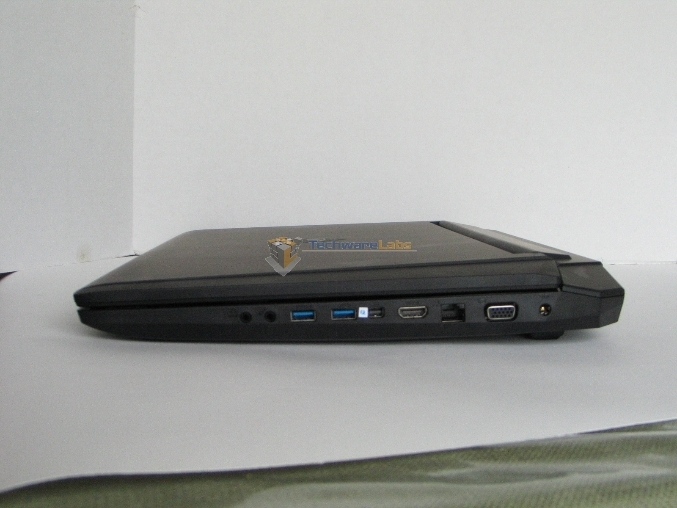 On the left side, the DVD drive is bracketed by a pair of USB 3.0 ports and a memory card reader. The de rigueur Kensington Lockport is lined up near the hinge. On the right side, the port lineup includes analog headphone and microphone jacks, two USB 3.0 ports, a Thunderbolt port, a HDMI port, Gigabit Ethernet, VGA output, and power. The front is unremarkable aside from a row of status LED’s that indicate power, battery charging state, hard drive access, WI-Fi status, and Num Lock status. There’s no latch to hold the lid closed, though the stiff hinge makes that unnecessary. The most prominent feature on the rear is the pair of cooling vents that provide intake and exhaust for the G750’s unusual cooling system – more on that below. A subtle Republic of Gamers logo embossed in the center just above the battery compartment adds a little touch of class. The angular, minimalist aesthetic continues on the inside. Triangular accents and subtle lines help to break up the almost-inevitably boxy look of such a large laptop. 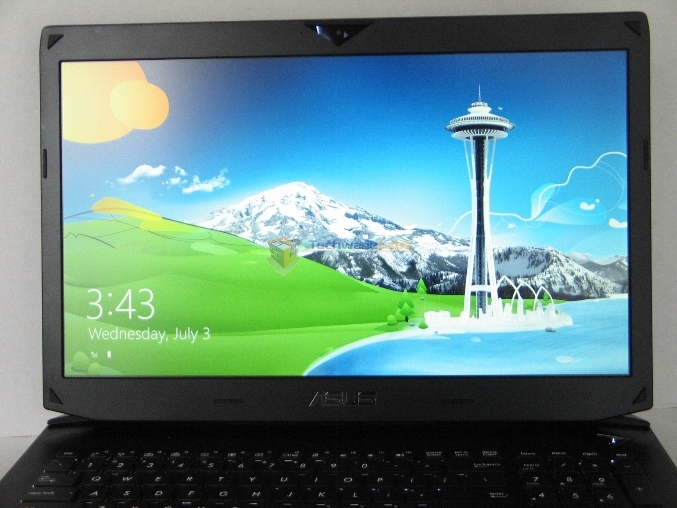 The screen is a 17″ TN panel with a matte finish. Color saturation is unusually good for this type of panel, and viewing angles are about as wide as one can hope to expect. Some minor color banding is present, though you aren’t likely to notice it outside of photo and video editing tasks. Unlike the exterior, the interior is finished in brushed aluminum, though it is just as much of a fingerprint magnet. 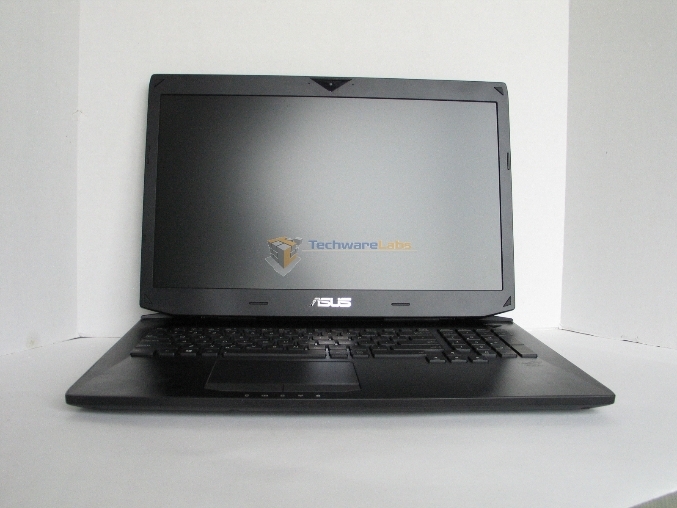 The keyboard layout will be immediately familiar to anyone who has spent time with any other Asus laptop. 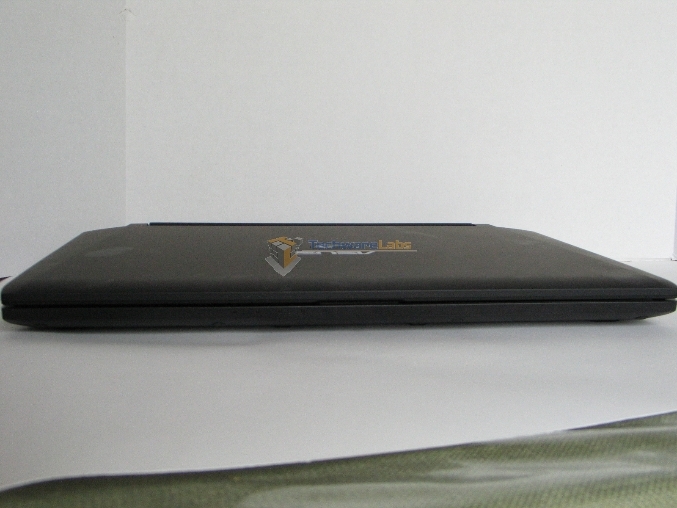 The layout is more or less ANSI standard, though compacted somewhat to fit a laptop. 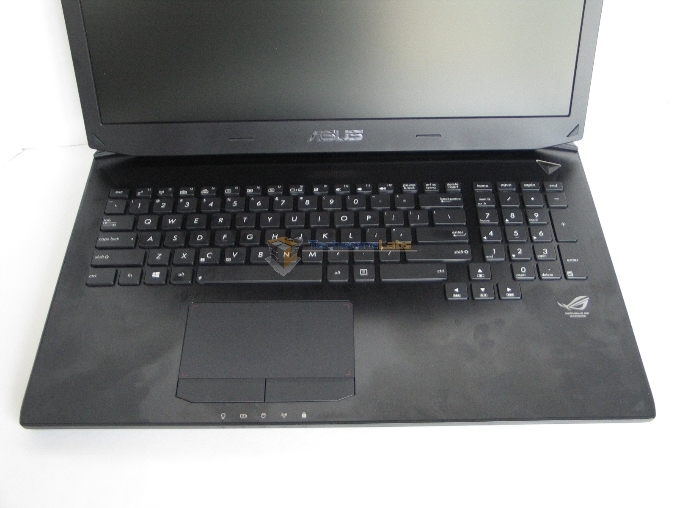 The F1-F12 keys double as hotkeys for volume, display and keyboard backlight brightness, internal/external display toggle, Wi-Fi/Bluetooth on/off toggle, display and trackpad on/off toggle, and sleep. 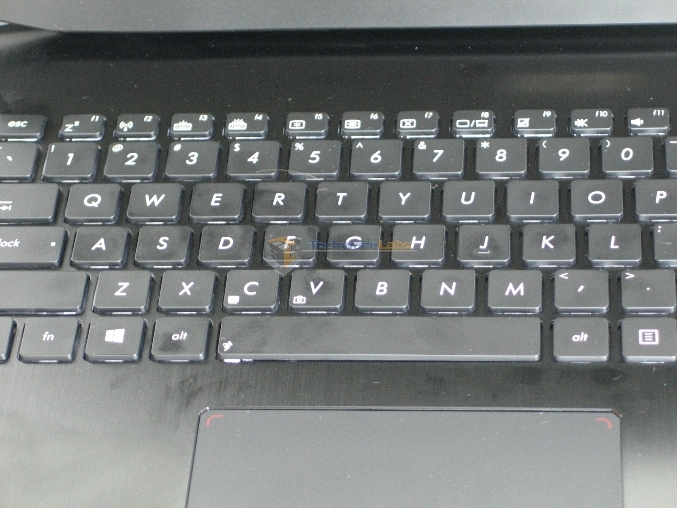 The main typewriter area keys are well labeled and well spaced, with a subtle white backlight. The right control and shift keys, which are commonly shortened or repositioned on less well-thought-out keyboards, are large and properly positioned for easy touch typing. The trackpad is a distinct improvement over previous efforts. Ironically, this is the one part of the laptop that does not collect fingerprints. The pad is large and sensitive; the buttons are sized to match and well hinged to make off-center presses with the side of the thumb easy. The included touchpad control software also lets you turn off edge gestures, which greatly decreased my frustration with Windows 8 doing things I didn’t intend for it to do. The G750 uses a soldered CPU! You can’t upgrade it down the road to an extreme CPU when they get cheaper. It’s a stupid move from Asus IMO. That laptop is already one of the heaviest, largest single GPU laptops out there, yet their competitors can make a lighter weight laptop with the same specs with an upgradeable socketed CPU! It’s worse yet that they haven’t addressed why they went with the soldered 4700HQ processor versus the 4700MQ. Stop banging on about soldered processors. They are all going this way now. If you want a PC that you can upgrade the cpu, BUY A DESKTOP!! btw I have noticed that nearly all sites that are reviewing the G750, you have cut/pasted the same comments in, do you work for Alienware by chance?